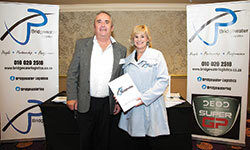 There were six companies sponsoring the TAPA conference in July this year. During the conference they all had a few minutes to talk about what they do to enhance security in the logistics business. A brief summary of what the sponsors had on show is below. 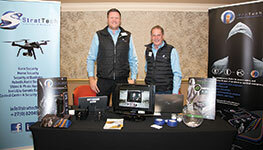 Bridgewater Logistics was a repeat sponsor at the TAPA conference. The company’s Richard Venter says Bridgewater’s display included brochures on the logistics company as well as its new secure parking site/truck stop in Pomona, Kempton Park. Visitors to the display were also able to obtain other promotional information. In addition, he says the company found the conference to be very informative with excellent speakers from delegates and sponsors alike. “Of particular interest to us were the presentations by Lawrence Brown, and Paul Linders from TAPA EMEA that included the new EMEA Standard for Parking Security Requirements (PSR) 2017 – EMEA Region. “We launched our Bridgewater Parking Business on the same day as the conference, and after visiting the specified requirements for TAPA Certification, found that there was precious little that we had to do to get certification, and become what will probably be one of the first TAPA Certified Truck Stops / Vehicle Parking Sites in the country. We have subsequently done everything required to comply and will be going for certification within the next month. 3. GLAM Lock (a lock that is integrated on the truck solutions (8-ton, 16-ton, roller doors and curtain rails). 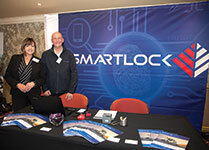 The company’s Johan Fick says Smartlock demonstrated the functionality of the locks by creating and editing schedules and showing the delegates how the sequence works for the locking solution. 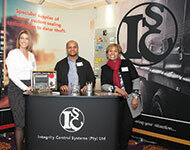 Integrity Control Systems (ICS) offers a range of integrity monitoring enablers (security seals, labels, tape, bags, keyrings and bins) that allow companies to transport goods safely, while also ensuring they will easily be able to see any tampering when the goods arrive at their destination. Claudia Coetzer, MD of ICS provided an example of how the company assists DHL manage its risks more effectively across business divisions through the implementation of various tamper-indicative products. 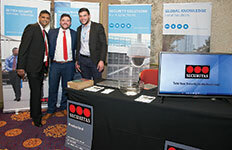 Securitas showcased its integrated security solutions aimed at the logistics market. Securitas’s RVS is a cost effective, remotely based video surveillance service that covers alarm verification, entry/exit management, area protection, video patrolling, and business intelligence applications. The company had a video feed showing how RVS would work in an emergency, as well as a live link to the RVS system at Securitas’s office. Also on show was Securitas Vision, a guard tool developed to provide complete control over field operations. This tool enables greater visibility and efficiency which is carried out by a streamlined and optimised organisational process. The tool is equipped to provide the required information on a real-time basis. • Emergency security: iProTech, TrackBox. • Surveillance security technology: cameras with built-in artificial intelligence, drones, CCTV-cameras etc. • Security solutions that will disrupt and discourage a criminal from committing a crime – Synthetic DNA. • Security solutions that will help to locate, detain and prosecute criminals when a crime was committed: iProTech, drones. 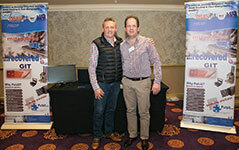 Pulsit’s Jacques van Wyk and Gerrie van Wyk were at the conference and the company highlighted its abilities to help the logistics industry better manage costs and performance. As mentioned in the Pulsit presentation, the company is focused on helping clients find the balance between optimal management, profitability and a good reputation. While security is central to what it does, Pulsit’s solutions meet a broader need and its tools help its clients achieve and maintain a competitive edge in the demanding fleet and logistics industry. In this regard, the company offers tracking solutions, mobile camera solutions for use on the road, as well as a number of business intelligence offerings.